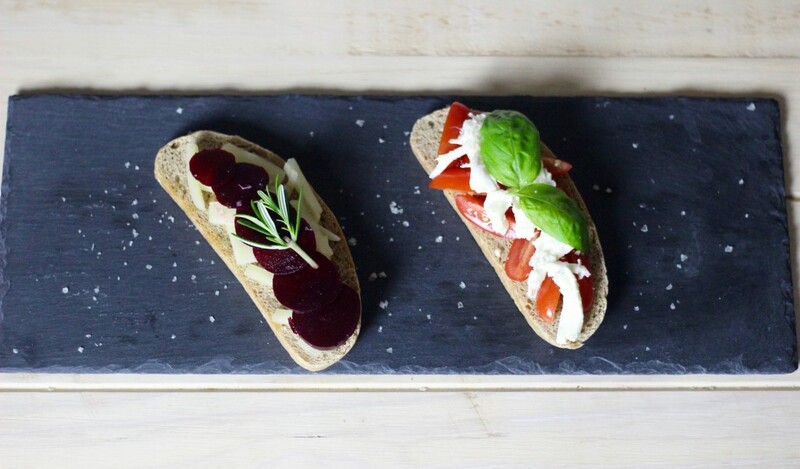 Half appetiser, half main dish, half “cicchetto“, bruschetta is a dish you can easily prepare with very few basic ingredients that you have at home. The success of a good bruschetta is of course the quality of the bread you use. I would recommend a good sourdough or homemade bread like the one I made here for best results. One can say it was the “traditional” dish for teenagers in the years ’90s and 00’s, as it barely involves any cooking, just the ability to turn on the oven and cut mozzarella and toppings. I personally love its versatility, as you can use pretty much whatever you want. No, pineapple is not an option, but since my lovely hubbie pointed out I should be more tolerant towards fruits in savoury food, if you really really want to use it, please add some cracked mixed berries pepper and some chili on top at least. Here you’ll have a very classic version, and a more extravagant version which is equally interesting. I hope you like it, and let me know which is your favourite bruschetta topping! Toast the bread in the oven or on the BBQ until nice and golden. Rub a garlic clove on the bread (only if you are with friends; for a romantic dinner I would skip this passage) and drizzle a bit of olive oil. Cut in 4 the cherrie tomatoes, add a bit of salt and some sliced basil and let it drain on a strainer for 10 minutes. Dice or tear the mozzarella in small pieces. If you want to get the most out of the mozzarella, let it stay at room temperature in its liquid for one hour before using it. Top the bread with mozzarella and tomatoes and garnish with a fresh basil leave on each bruschetta. You can also cook the bruschetta in the oven until the mozzarella has melted, but it depends on how you like it. Prepare the bread as above. 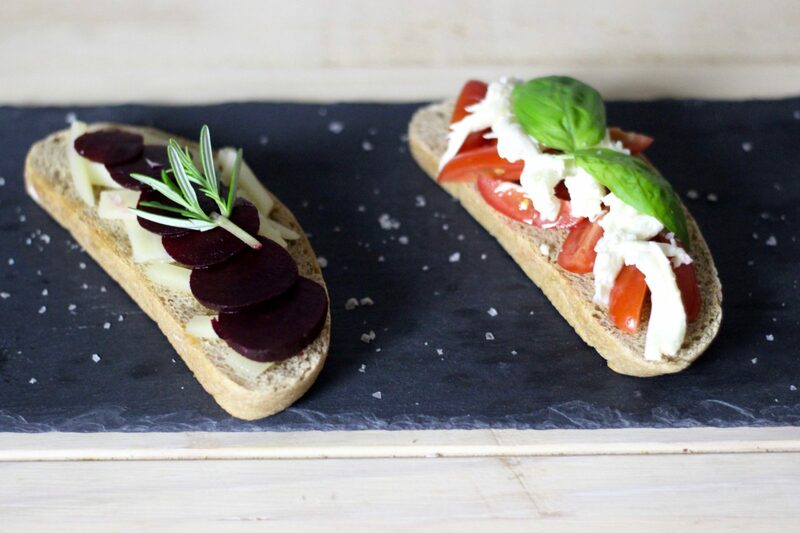 Dice the Provolone and slice the baby beetroot. Sprinkle a bit of fresh rosemary on top and add some cracked pepper. Garnish with rosemary spring. Tonight let’s keep it 90’s Italian teenager, so enjoy “L’ombelico del mondo” by Lorenzo Jovanotti Cherubini. I LIKE THE LOOK OF THIS RECIPE. I AM NOT A COOK BUT I AM SURE THAT I WILL BE ABLE TO PUT THIS BRUSCHETTA TOGETHER.